We have been overwhelmed with requests and orders and have therefore decided to drop prices for a week. Normal costs are R 2300.00 per Dog Tag in Sterling Silver, this includes the UPS courier service to anywhere in the world (If UPS operates in that country) and then the personal details or message on the back of the Tag. 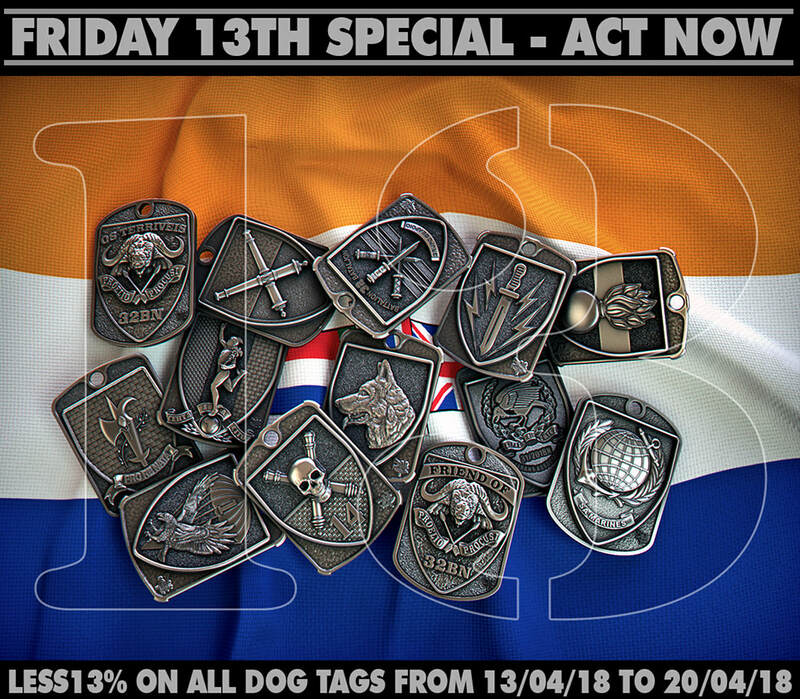 We are offering 13% off on all Dog Tags ordered within the week 13 March 2018 to 20 March 2018. This will include all military units we may not yet have designed, thus the option to upload an image of the required unit insignia. Orders must be paid for before any processing will be done. Please submit an order form for each tag order unless they are of the same unit with same details on the back (replicas). Dog Tags will only be R2000.00 during this period. On submitting you will receive a mail with our banking details and further instructions, once we have proof of payment order will be processed and you will get a mail with confirmation of what you ordered with an image of your details that have to appear on the back, plus the address you specified.